You can also download the entire Love's Labor's Lost translation as a PDF! BIRON enters, with a piece of paper. The king he is hunting the deer; I am coursing myself: they have pitched a toil; I am toiling in a pitch,—pitch that defiles: defile! a foul word. Well, set thee down, sorrow! for so they say the fool said, and so say I, and I the fool: well proved, wit! By the Lord, this love is as mad as Ajax: it kills sheep; it kills me, I a sheep: well proved again o' my side! I will not love: if I do, hang me; i' faith, I will not. O, but her eye,—by this light, but for her eye, I would not love her; yes, for her two eyes. Well, I do nothing in the world but lie, and lie in my throat. By heaven, I do love: and it hath taught me to rhyme and to be melancholy; and here is part of my rhyme, and here my melancholy. Well, she hath one o' my sonnets already: the clown bore it, the fool sent it, and the lady hath it: sweet clown, sweeter fool, sweetest lady! By the world, I would not care a pin, if the other three were in. Here comes one with a paper: God give him grace to groan! The king is currently hunting deer, while I am cursing myself; they have laid their traps for their prey while I have been captured by that black, sticky substance of love and am now infected by it—infected! That is a dirty word. Anyway, be patient sadness! For this is supposedly what the fool said and now I say it too, so I must be a fool, oh well said! My goodness, being in love is as mad as Ajax. It kills sheep, it kills me, oh then I must be a sheep! Well said again! I will not love. If I do, kill me anyway! Truthfully I cannot love. Oh, but her eye, her eye allows me to see, I wouldn't love her if not for her two eyes. Oh the only thing I seem to do in this world is tell gross lies and I can feel them in my throat. By heaven, I do love and it has taught me how to write poetry and here is part of my poem, and here is my sadness. I've already sent her one of my sonnets, Costard that clown took it to her, I, the fool sent it and she now has it—sweet clown, sweeter fool, sweetest lady! By the world I wouldn't mind at all, if the other three were in love. Here comes one of the others with paper—oh please let him be groaning like I am! [Aside] Shot, by heaven! Proceed, sweet Cupid:thou hast thumped him with thy bird-bolt under theleft pap. In faith, secrets! [To himself] My goodness, he has been struck too! Carry on, sweet Cupid, you have shot him in the heart with your arrow. Let's hear what he will confess! [Reads] So sweet a kiss the golden sun gives not To those fresh morning drops upon the rose, As thy eye-beams, when their fresh rays have smote The night of dew that on my cheeks down flows: Nor shines the silver moon one half so bright Through the transparent bosom of the deep, As doth thy face through tears of mine give light; Thou shinest in every tear that I do weep: No drop but as a coach doth carry thee; So ridest thou triumphing in my woe. Do but behold the tears that swell in me, And they thy glory through my grief will show: But do not love thyself; then thou wilt keep My tears for glasses, and still make me weep. O queen of queens! how far dost thou excel, No thought can think, nor tongue of mortal tell. How shall she know my griefs? I'll drop the paper: Sweet leaves, shade folly. Who is he comes here? [Reading] The golden sun doesn't shine so brightly on the fresh dew of a morning rose, as your eyes do, when they look after my cheeks, covered with last night's tears. The silver moon doesn't shine half as bright in the dead of night, as your face shines through my tears. You are reflected in every tear that I weep, every drop is like a coach to carry you away, as you ride and rejoice at my sadness. Just look at the tears that grow in me and know that they show your glory by the effect that it has on me. Yet, don't just love yourself, since then my tears will just be like a mirror for you to look at yourself in, and I will keep crying. Oh queen of queens! How incredible you are cannot even be thought of, it cannot be put into words. How will you know my pains? I will give you paper, and the leaves will hide my silliness. Wait, who is coming? What, Longaville! and reading! listen, ear. Oh, it is Longaville, and he is reading! I will listen to what he has to say. Now, in thy likeness, one more fool appear! He looks as lovesick as you do, another foolish man! Ay me, I am forsworn! Oh poor me, I am finished! Why, he comes in like a perjure, wearing papers. Look at him, he comes in dressed like a liar, covered in papers. In love, I hope: sweet fellowship in shame! I hope he's in love, I could use the company! One drunkard loves another of the name. One lovesick man loves another woman. Am I the first that have been perjured so? Am I the first to be untruthful in this way? I could put thee in comfort. Not by two that I know:Thou makest the triumviry, the corner-cap of society,The shape of Love's Tyburn that hangs up simplicity. I wish I could comfort you and tell you that I know two more who are like you—you make up the trio, the villains of society, the men trapped in love's prison, hanged for their stupidity. I fear these stubborn lines lack power to move:O sweet Maria, empress of my love!These numbers will I tear, and write in prose. I fear that my poetry will not make her love me. Oh sweet Maria, the ruler of my heart, I will tear up these verses and write in prose instead. O, rhymes are guards on wanton Cupid's hose:Disfigure not his slop. Did not the heavenly rhetoric of thine eye, 'Gainst whom the world cannot hold argument, Persuade my heart to this false perjury? Vows for thee broke deserve not punishment. A woman I forswore; but I will prove, Thou being a goddess, I forswore not thee: My vow was earthly, thou a heavenly love; Thy grace being gain'd cures all disgrace in me. Vows are but breath, and breath a vapour is: Then thou, fair sun, which on my earth dost shine, Exhalest this vapour-vow; in thee it is: If broken then, it is no fault of mine: If by me broke, what fool is not so wise To lose an oath to win a paradise? Didn't the heavenly words that your eye speaks, words that no-one in the world can debate against, convince my heart to be dishonest in this way? The vows that I have broken for you don't deserve to be punished. I promised to abandon all women, but if I can prove that you are the goddess I think you are, then I have not broken any promise. My oath was made on the earth, but you are a heavenly love, and if I can win your favor then all my disgraces will be gone. Vows are just breath and breath is like a vapor that melts away. Then it is you, fair sun, that shines on my earth, evaporating this vapor and my vow, it is you who has done it. If the vow is broken then, it isn't my fault. If it is broken by me, then what fool wouldn't forget any oath to win a paradise? This is the liver-vein, which makes flesh a deity,A green goose a goddess: pure, pure idolatry.God amend us, God amend! we are much out o' the way. This is written in the lover's style, which tries to make humans seem like gods, a silly young woman seem like a goddess. It is pure, pure glorification. God help us, God help us! Something has gone really wrong. By whom shall I send this?—Company! stay. Who shall I send this poem with? There's someone here, hang on. All hid, all hid; an old infant play.Like a demigod here sit I in the sky.And wretched fools' secrets heedfully o'ereye.More sacks to the mill! O heavens, I have my wish! Everyone's hiding, it's like an old childish game and I sit here like a demigod, overseeing these silly fools confess their secrets. There is more to come! Oh wonderful, I have my wish! Dumain is transformed as well! Four fools in one place! By heaven, the wonder in a mortal eye! By heaven, the wonder of her mortal eye. By earth, she is not, corporal, there you lie. You should say "by earth" as she is human, there you have already lied. Her amber hair for foul hath amber quoted. Her amber hair makes the color amber itself even look ugly. An amber-colour'd raven was well noted. An amber-colored raven would be a better description. As upright as the cedar. She is as upright as a cedar tree. Stoop, I say;Her shoulder is with child. Come down to earth! Her shoulder is humped. She is as beautiful as the day. Ay, as some days; but then no sun must shine. Yes, maybe she is as beautiful as the days when the sun doesn't shine. O that I had my wish! Oh that I could have my love! And I mine too, good Lord! And I have mine as well, good Lord! Amen, so I had mine: is not that a good word? So be it, if I could have mine too—isn't that good of me? I would forget her; but a fever sheReigns in my blood and will remember'd be. I would try to forget her, but she has made my blood hot and so must be remembered. A fever in your blood! why, then incisionWould let her out in saucers: sweet misprision! She has caused a fever in your blood—oh then we should cut you and let the blood pour out. Sweet mistake! Once more I'll read the ode that I have writ. I will read the verse once more. Once more I'll mark how love can vary wit. And once more I will hear how a clever man's words can change when he is in love. [Reads] On a day—alack the day!— Love, whose month is ever May, Spied a blossom passing fair Playing in the wanton air: Through the velvet leaves the wind, All unseen, can passage find; That the lover, sick to death, Wish himself the heaven's breath. Air, quoth he, thy cheeks may blow; Air, would I might triumph so! But, alack, my hand is sworn Ne'er to pluck thee from thy thorn; Vow, alack, for youth unmeet, Youth so apt to pluck a sweet! Do not call it sin in me, That I am forsworn for thee; Thou for whom Jove would swear Juno but an Ethiope were; And deny himself for Jove, Turning mortal for thy love. This will I send, and something else more plain, That shall express my true love's fasting pain. O, would the king, Biron, and Longaville, Were lovers too! Ill, to example ill, Would from my forehead wipe a perjured note; For none offend where all alike do dote. [Reading] On a day, oh on that day! Playing in the shameless air. Will wish that he has the breath of heaven. It would be an honor." To never pluck you from your stem. When a young man is so ready to pluck a sweet flower! Even though I have sworn against you. And would become a mortal to be with you. I will send this sonnet, and another plainer letter that will be express the pain I have from not being with her. Oh I wish that the King, Biron and Longaville were lovers as well. If my wrongdoings could be justified by theirs, it would save me from being considered a liar, as none of us could get in trouble if we've all done the same. [Advancing] Dumain, thy love is far from charity.That in love's grief desirest society.You may look pale, but I should blush, I know,To be o'erheard and taken napping so. [Coming forwards] Dumain, your love isn't Christian love, that looks for company in its trouble. You look pale, but it is me who should be blushing, for having listened to you from my hiding place. [Coming forwards] Come sir, you blush because you feel exactly the same as he does. You tell him off, but you're twice as bad as he is! Don't you love Maria? Longaville didn't compose a sonnet for her, or hold his arms crossed over his chest to keep his heart in its place. I have been hidden in this bush and have watched you both and felt embarrassed for both of you. I heard your poems, I watched your behavior, I heard your sighs and noted your passions. "Oh me!" says one of you, "Oh Jupiter," the other one cries. For one of you, you talked about her golden hair, the other one talked about the jewels in her eyes. [To LONGAVILLE] You are prepared to break your vow for this paradise. And Jove, for your love, would infringe an oath. What will Biron say when that he shall hear Faith so infringed, which such zeal did swear? How will he scorn! how will he spend his wit! How will he triumph, leap and laugh at it! For all the wealth that ever I did see, I would not have him know so much by me. [To DUMAIN] And you think even Jupiter would break a promise to have your love. What will Biron say when he hears that your promises have been broken, when you swore to keep them with such enthusiasm? How he will scorn, how he will mock you! How he will hold it over you, laughing at your ridiculousness! For all the money I have, I would hate for him to have seem himself in the way I've seen you. Now step I forth to whip hypocrisy. Now I will come forwards to stir things up even more. Ah, good my liege, I pray thee, pardon me! Good heart, what grace hast thou, thus to reprove These worms for loving, that art most in love? Your eyes do make no coaches; in your tears There is no certain princess that appears; You'll not be perjured, 'tis a hateful thing; Tush, none but minstrels like of sonneting! But are you not ashamed? nay, are you not, All three of you, to be thus much o'ershot? You found his mote; the king your mote did see; But I a beam do find in each of three. O, what a scene of foolery have I seen, Of sighs, of groans, of sorrow and of teen! O me, with what strict patience have I sat, To see a king transformed to a gnat! To see great Hercules whipping a gig, And profound Solomon to tune a jig, And Nestor play at push-pin with the boys, And critic Timon laugh at idle toys! Where lies thy grief, O, tell me, good Dumain? And gentle Longaville, where lies thy pain? And where my liege's? all about the breast: A caudle, ho! [Coming forwards] My good lord, I pray you, forgive me! Good heart, what a privilege it is for you to be able to tell these miserable creatures off for loving, when you are the most in love out of all of them? Are you telling me that your eyes aren't coaches ready to carry the Princess away, that her face doesn't appear in your tears? You won't reveal that you've been dishonest too, that is not very nice. My goodness, you are all entertainers with your poetry! But aren't you ashamed? Are you not ashamed, all three of you, to be so wrong? You saw his hypocrisy, the King saw yours, but I've seen the liar in all three of you. Oh what a scene of foolery have I witnessed, a scene filled with sighs, groans, sadness and grief! Oh it has been hard for me to have the patience to watch, as I have seen a King transformed into nothing! I have seen great Hercules off his head, serious Solomon trying to sing a song, Nestor playing a game with children, and the critical Timon laughing at pointless games! Where does it hurt, oh tell me, good Dumain? And gentle Longaville, where is your pain? And where is the King's? Is it deep in your chest, we must get you a drink! Too bitter is thy jest.Are we betray'd thus to thy over-view? You are too mean in your jokes. Have we been betrayed by what you have seen? Not you to me, but I betray'd by you: I, that am honest; I, that hold it sin To break the vow I am engaged in; I am betray'd, by keeping company With men like men of inconstancy. When shall you see me write a thing in rhyme? Or groan for love? or spend a minute's time In pruning me? When shall you hear that I Will praise a hand, a foot, a face, an eye, A gait, a state, a brow, a breast, a waist, A leg, a limb? You haven't been betrayed by me, but I have been betrayed by you. I am an honest man and think it is a sin to break the vow that I have promised to keep. I am betrayed by hanging out with men who are so unfaithful. When will you see me write something in rhyme? Or groan for love? Or spend even a minute grooming myself? When will you hear me praising a hand, a foot, a face, an eye, a way of walking, a posture, a brow, a breast, a waist, a leg, a limb? Soft! whither away so fast?A true man or a thief that gallops so? Be quiet! Why do you go away so quickly? I post from love: good lover, let me go. I hurry away from love. Good lover, let me go. JAQUENETTA and COSTARD enter, with a letter. What present hast thou there? What gift have you got there? What does treason have to do with it? Nay, it makes nothing, sir. Treason doesn't have to do anything sir, it's just treason. If it mar nothing neither,The treason and you go in peace away together. Then I don't have to let it ruin anything either. This treason and you can go away in peace together then. I beseech your grace, let this letter be read:Our parson misdoubts it; 'twas treason, he said. I ask your grace, read this letter. The Parson has suspicions about it, he said it was treason. [Giving BIRON the paper] Biron, read it. Costard, where did you get it? Of Dun Adramadio, Dun Adramadio. From Dun Adramadio, from Dun Adramadio. BIRON tears up the letter. How now! what is in you? why dost thou tear it? Hey! What are you doing? Why did you tear it up? A toy, my liege, a toy: your grace needs not fear it. It was nothing, my lord, nothing—your grace doesn't need to worry about it. It did move him to passion, and therefore let's hear it. It made him have a tantrum, so I think we should hear it. It is Biron's writing, and here is his name. [Gathering up the pieces] It is in Biron's writing, and look, here's his name. [To COSTARD] Ah, you whoreson loggerhead! you wereborn to do me shame.Guilty, my lord, guilty! I confess, I confess. [To COSTARD] Oh you stupid idiot! You were born to get me in trouble. Guilty, my lord, guilty! I confess, I confess. That you three fools lack'd me fool to make up the mess:He, he, and you, and you, my liege, and I,Are pick-purses in love, and we deserve to die.O, dismiss this audience, and I shall tell you more. That you three idiots needed me to make our group complete. [Pointing at the other Lords] He, he, yes you, you, my lord, and I, are cheats for love, and we deserve to die. Oh, get rid of these two and I will tell you more. Now the number is even. True, true; we are four.Will these turtles be gone? True, true, there are four of us. Will these lovers leave? Okay you two, time to go! Walk aside the true folk, and let the traitors stay. The honest people will walk away and leave the traitors behind. Sweet lords, sweet lovers, O, let us embrace! As true we are as flesh and blood can be: The sea will ebb and flow, heaven show his face; Young blood doth not obey an old decree: We cannot cross the cause why we were born; Therefore of all hands must we be forsworn. My sweet lords, sweet lovers, oh let's hug it out! Our friendship is as true and real as it can be, as true as the fact that the sea will have tides, and heaven will show his face. Young men cannot obey an old oath, we cannot go against our destiny, therefore we are bound to break our promises. What, did these rent lines show some love of thine? What, did these lines we have been given show some love of yours? Did they, quoth you? Who sees the heavenly Rosaline, That, like a rude and savage man of Inde, At the first opening of the gorgeous east, Bows not his vassal head and strucken blind Kisses the base ground with obedient breast? What peremptory eagle-sighted eye Dares look upon the heaven of her brow, That is not blinded by her majesty? Did they, you ask! Who has seen the heavenly Rosaline, that would not, like an ignorant and uncivilized man of India, on seeing the first light of dawn, bow his inferior head and struck blind by its light, kiss the ground with a willing heart? What unblinking, strong eye would dare to look at the heaven of her face and not be blinded by her beauty? What zeal, what fury hath inspired thee now?My love, her mistress, is a gracious moon;She an attending star, scarce seen a light. What desire, what frenzy has inspired you now? My love, her mistress, is like a gracious moon whereas Rosaline is just an attending star, her light can only just be seen. My eyes are then no eyes, nor I Biron: O, but for my love, day would turn to night! Of all complexions the cull'd sovereignty Do meet, as at a fair, in her fair cheek, Where several worthies make one dignity, Where nothing wants that want itself doth seek. Lend me the flourish of all gentle tongues,— Fie, painted rhetoric! O, she needs it not: To things of sale a seller's praise belongs, She passes praise; then praise too short doth blot. A wither'd hermit, five-score winters worn, Might shake off fifty, looking in her eye: Beauty doth varnish age, as if new-born, And gives the crutch the cradle's infancy: O, 'tis the sun that maketh all things shine. My eyes then are not eyes, and I am not Biron if what you say is true. Oh, were it not for my love, day would turn to night! The best parts of all complexions come together in her cheek, all different kinds of value come together to make one excellent thing, and nothing that you would want is missing. Give me the words of all noble tongues, I don't need rhetoric! Oh and she doesn't need it either, as a man praises the thing that he wants to sell and she surpasses all praise; any praise is not good enough to describe her! An old hermit, worn down by fifty winters, could shake off these fifty years just by looking in her eye—her beauty improves age, making people feel newly-born and gives old age the energy of youth. Oh it is her, the sun, that makes all things shine! By heaven, thy love is black as ebony. By heaven, your love is as black as ebony! Is ebony like her? O wood divine! A wife of such wood were felicity. O, who can give an oath? where is a book? That I may swear beauty doth beauty lack, If that she learn not of her eye to look: No face is fair that is not full so black. Is she like ebony? Oh then this wood is divine! A wife of this wood would be a happy thing. Oh who should swear to an oath?! Find me a bible. I want to swear on it that beauty is missing out if it doesn't learn from Rosaline's eye how to appear—there is no face so beautiful, as one that is dark. O paradox! Black is the badge of hell,The hue of dungeons and the school of night;And beauty's crest becomes the heavens well. That's a contradiction! Black is a sign of hell, it is the color of dungeons and the teacher of night's darkness. It is the sun which makes the heavens more beautiful. Devils soonest tempt, resembling spirits of light. O, if in black my lady's brows be deck'd, It mourns that painting and usurping hair Should ravish doters with a false aspect; And therefore is she born to make black fair. Her favour turns the fashion of the days, For native blood is counted painting now; And therefore red, that would avoid dispraise, Paints itself black, to imitate her brow. The Devil can transform itself into an angel of light. Oh, if my lady's eyebrows were painted black like the fashion, it would show how cosmetics and false hair can tempt lovers with misleading appearances. Therefore she is born to make darkness beautiful again. Her face completely changes, and turns around what is considered fashionable nowadays. For a complexion that is naturally reddish in its color is now only used for paintings, and so women who have this complexion paint themselves black in order to be praised and to look like her. To look like her are chimney-sweepers black. Chimney-sweepers now try to look like her. And since her time are colliers counted bright. And since her, even coal miners are thought to be beautiful. And Ethiopes of their sweet complexion crack. And even Ethiops boast about their sweet complexions. Dark needs no candles now, for dark is light. We don't even need candles now when it is dark, because darkness has become light. Your mistresses dare never come in rain,For fear their colours should be wash'd away. Your mistresses should make sure that they never go outside in the rain, because their make-up would all be washed away. 'Twere good, yours did; for, sir, to tell you plain,I'll find a fairer face not wash'd to-day. Well then, it would be good if your mistress did go outside in the rain, because sir, her face could do with being washed. I'll prove her fair, or talk till doomsday here. I will prove her to be beautiful, or I will talk until the end of the world. No devil will fright thee then so much as she. Then on the last day of the world, she will be more frightening than any devil. I never knew man hold vile stuff so dear. I never knew a man to care so much about something so cheap. Look, here's thy love: my foot and her face see. Look, here's your love—you can look at my black shoe and see her face. O, if the streets were paved with thine eyes,Her feet were much too dainty for such tread! Oh, even if the streets were covered with your eyes, her feet would be too elegant to walk on them! O, vile! then, as she goes, what upward liesThe street should see as she walk'd overhead. Oh, that's disgusting! As she walks, these eyes would have to see up her dress as she walks on them. But what of this? are we not all in love? But what does this mean? Are we all in love? Nothing so sure; and thereby all forsworn. Oh that is certain, and so we have all broken our oath! Then leave this chat; and, good Biron, now proveOur loving lawful, and our faith not torn. Then let's stop this conversation and good Biron, use your logic to demonstrate to us that our loving is okay and our faith is not broken. Ay, marry, there; some flattery for this evil. Yes indeed, do that—make this evil seem a bit better. O, some authority how to proceed;Some tricks, some quillets, how to cheat the devil. Oh, give us some ideas about what we should do next—some tricks, some subtle verbal distinctions to avoid being seen as liars. Some medicine for our illness. 'Tis more than need. Have at you, then, affection's men at arms. Consider what you first did swear unto, To fast, to study, and to see no woman; Flat treason 'gainst the kingly state of youth. Say, can you fast? your stomachs are too young; And abstinence engenders maladies. O, we have made a vow to study, lords, And in that vow we have forsworn our books. For when would you, my liege, or you, or you, In leaden contemplation have found out Such fiery numbers as the prompting eyes Of beauty's tutors have enrich'd you with? Other slow arts entirely keep the brain; And therefore, finding barren practisers, Scarce show a harvest of their heavy toil: But love, first learned in a lady's eyes, Lives not alone immured in the brain; But, with the motion of all elements, Courses as swift as thought in every power, And gives to every power a double power, Above their functions and their offices. It adds a precious seeing to the eye; A lover's eyes will gaze an eagle blind; A lover's ear will hear the lowest sound, When the suspicious head of theft is stopp'd: Love's feeling is more soft and sensible Than are the tender horns of cockl'd snails; Love's tongue proves dainty Bacchus gross in taste: For valour, is not Love a Hercules, Still climbing trees in the Hesperides? Subtle as Sphinx; as sweet and musical As bright Apollo's lute, strung with his hair: And when Love speaks, the voice of all the gods Makes heaven drowsy with the harmony. Never durst poet touch a pen to write Until his ink were temper'd with Love's sighs; O, then his lines would ravish savage ears And plant in tyrants mild humility. From women's eyes this doctrine I derive: They sparkle still the right Promethean fire; They are the books, the arts, the academes, That show, contain and nourish all the world: Else none at all in ought proves excellent. Then fools you were these women to forswear, Or keeping what is sworn, you will prove fools. For wisdom's sake, a word that all men love, Or for love's sake, a word that loves all men, Or for men's sake, the authors of these women, Or women's sake, by whom we men are men, Let us once lose our oaths to find ourselves, Or else we lose ourselves to keep our oaths. It is religion to be thus forsworn, For charity itself fulfills the law, And who can sever love from charity? Oh it is more than necessary. Here it goes then, love's warriors. Think about what you first promised, to fast, to study and to see no women—promising to do these things is treason against the best time of your life. Think about it, should we fast? Our stomachs are too young and not eating could give us diseases. Also think about your promise to study, lords, and the fact that this vow has made us reject our books, for we wouldn't know how to write poetry without seeing a woman's beautiful face. Other dull or more serious kinds of learning clog up the arteries, and are done for so long and take such effort that you don't end up learning much anyway. Love is first learned in a lady's eyes, it cannot be confined simply to the mind, it lives with the winds and the storms. It moves as quickly as thoughts through every part of you, and gives a double force to each part it visits, above and beyond their ordinary functions. It even gives a person precious eyesight, with eyes so bright they can blind an eagle, with an ear so sharp it can hear even the quietest sound, when a thief that is listening out for the slightest noise hears nothing. Love's touch is softer and more sensitive than the soft horns of a snail; Love's tongue shows itself to have better taste than even Bacchus. For its bravery, isn't Love like Hercules, still climbing trees in the Hesperides? It is subtle as a Sphinx, as sweet and musical as the sound of Apollo's lute, the strings made with Love's hair. When Love speaks, the voices of all other gods make heaven sleepy with the sound of their harmony. A poet never touches their pen unless their ink is full of Love's sighs and the lines they write have the power to please common ears and even make tyrants more humble. I get all of this information from women's eyes as they throw out sparks like the very fire which Prometheus stole from heaven. Their eyes are the books, the arts, the schools, that reflect, embody and feed the whole world, or without them nothing in the world seems good. You were fools to give up these women, and if you keep your oaths, you will still be fools. Do it for wisdom's sake, a word that all men love, do it for love's sake, a word that loves all men. Do it for men's sake, so they can write about these women, do it for women's sake, who put us on this earth. We must give up our oaths to find ourselves, or if we keep them we will lose ourselves completely. It is within the beliefs of our religion to change our mind, for charity is a part of the law, and isn't Love just loving another? Saint Cupid, then! and, soldiers, to the field! For Saint Cupid then! Like soldiers, let's go to our battlefield! Advance your standards, and upon them, lords;Pell-mell, down with them! but be first advised,In conflict that you get the sun of them. Hold up your flags and march with them lords. Attack them at close quarters! Be advised though, make sure that they have the sun in their eyes so that you can get the better of them. Now to plain-dealing; lay these glozes by:Shall we resolve to woo these girls of France? Now let's talk simply, lay these metaphors aside. Are we determined to woo these girls of France? And win them too: therefore let us deviseSome entertainment for them in their tents. And we will win them too! Let's think up some entertainment for them in their tents. First, from the park let us conduct them thither; Then homeward every man attach the hand Of his fair mistress: in the afternoon We will with some strange pastime solace them, Such as the shortness of the time can shape; For revels, dances, masks and merry hours Forerun fair Love, strewing her way with flowers. First, let's lead them from the park to their tents. Then, after that, each man can grab hold of the hand of his own, beautiful mistress. In the afternoon we will amuse them with some kind of new entertainment, whatever we can come up with this quickly. For it is said that things like celebrations, dances, masks, and happy times prepare a pathway for Love to enter. Away, away! no time shall be omittedThat will betime, and may by us be fitted. Let's go! There is no time to be lost in our preparations. Allons! allons! Sow'd cockle reap'd no corn; And justice always whirls in equal measure: Light wenches may prove plagues to men forsworn; If so, our copper buys no better treasure. Let's go! Let's go! We will get nothing but falsehoods and achieve nothing if we do not take the necessary measures to win these ladies. Strange, Lani. "Love's Labor's Lost Translation." LitCharts. LitCharts LLC, 19 May 2017. Web. 18 Apr 2019. Strange, Lani. "Love's Labor's Lost Translation." LitCharts LLC, May 19, 2017. Retrieved April 18, 2019. https://www.litcharts.com/shakescleare/shakespeare-translations/loves-labors-lost. 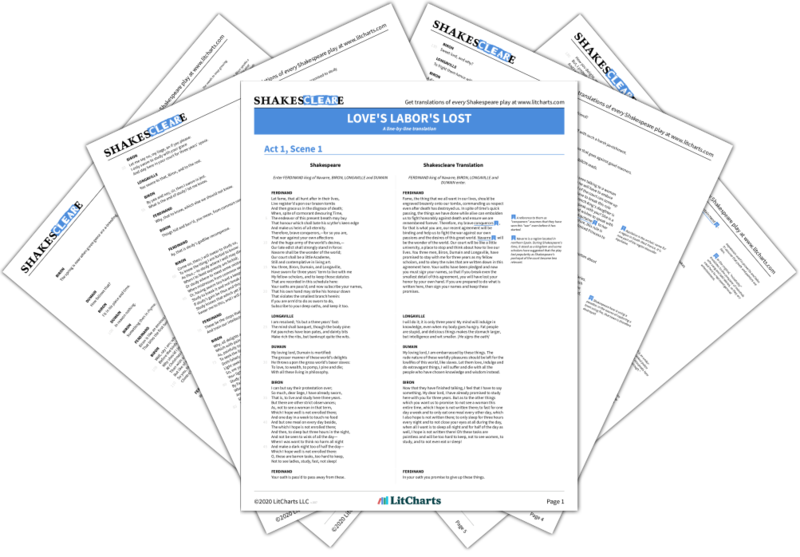 Join LitCharts A+ and get the entire Love's Labor's Lost Translation as a printable PDF. 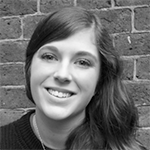 Lani is currently studying for an MA in Shakespeare Studies at King's College London and Shakespeare's Globe. She has a BA in English and Latin Literature from the University of Warwick and worked as a Teacher of Drama for a year in between her undergraduate and postgraduate degrees. She has a love for all things theatrical and spends all of her free time either watching theatre or taking part in it herself.